Students came out from all corners of the state for the march. Lucy Gellman Photos. Jeremy Stein raised his cell phone over his head, turning around to capture a bright, still-swelling mass of people holding handmade signs denouncing gun violence. The teachers among them stepped forward. On the count of three, they raised their arms above their heads. “Enough!” they cried. Stein pressed down on the photo button. He grinned and leaned back into a microphone. “I’m going to send that picture to every politician who doesn’t believe in common sense gun reform!” he announced. The director of Connecticut Against Gun Violence, Stein was one of over 20 to speak at the Hartford chapter of March for Our Lives, held Saturday afternoon at the State Capitol in Hartford. 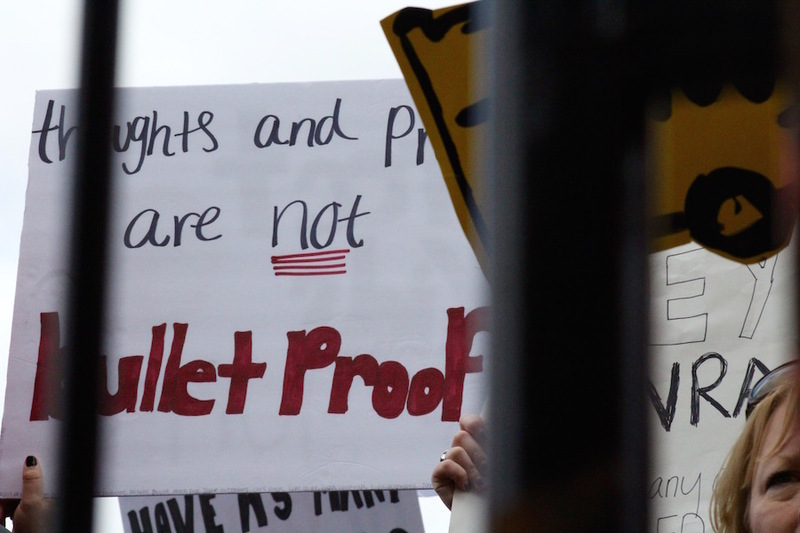 Organized by University of Bridgeport student Tyler Suarez, Connecticut Against Gun Violence, and Women's March CT - We March On, the event brought out students, teachers, parents and legislators from across the state. At least 10,000 people turned out for the event, according to Hartford Police. March For Our Lives was born earlier this year, as a national movement and demonstration against gun violence. Its conception and date was announced last month, after a mass shooting at Marjorie Stoneman Douglas High School in Parkland, Florida. In mid-march, students across the country voiced their support for the movement with school walkouts. On Saturday, Suarez announced that the March for Our Lives would double as the kickoff for CT Students Demand Action, a student-led group dedicated to anti-gun violence measures, phone banking and political organizing at the grassroots. As sister marches unfolded across the country, Hartford’s March For Our Lives delivered a strong, emotional plea for statewide and national gun reform, more restrictive gun laws, a blue wave to vote Republican legislators out of office, and a unified front against gun violence not only in schools, but also urban communities and cities that are often on the front lines of gun violence, but excluded from a national media spotlight. Tyler Suarez, who performed a song written for his aunt midway through the speaking program. “For every student who goes to school wondering if today might be their last … every parent who sends their child to school, wondering if that was the last time they kissed them goodbye … change is coming,” said Suarez, whose aunt Dawn Hochsprung was the principal at Sandy Hook Elementary School when a shooter entered the school and opened fire in December 2012, killing 20 children and six adults. March attendees had arrived earlier in the day, greeted by voter registration booths and orange-clad volunteers as they inched toward Connecticut State Capitol Park. Among cries of “Vote Them Out,” “Enough is Enough!,”and “Hey Hey/Ho Ho/The NRA Has Got To Go,” thousands of marchers gathered at the Corning Fountain, waving homemade signs that read “Enough,” “Schools Are For Learning, Not Dying,” “End Gun Violence,” and “Keep School Safe” among other slogans. As aspiring trauma surgeon and student at Francis T. Maloney High School, Carrero added that she’d come out with friends because she can’t stop thinking about the number of lives that have been cut short prematurely. Jo Schaller (at center), with new friend Elizabeth Brown, a 23-year-old student, and longtime friend Marisol Feliciano, who works in trauma at St. Francis Hospital. Meanwhile, non-students hovered nearby, making new friends as they chatted about gun reform. A police officer for the Connecticut State Attorney’s Office, Durham’s Jo Schaller said that she believes in gun ownership—she is a licensed gun owner, and has been for much of her life—but believes in “common sense gun reform” even more. The New Haven artist Julie Fraenkel designed several small posters for the event, commemorating students who have been lost to gun violence in school shootings. From somewhere in the park, John Lennon’s “Imagine” pumped out through a speaker, and a cheer went up from the middle of the crowd. As more attendees gathered at the Capitol Building and on the hill above, marchers wove their way up Capitol Avenue, some passing under its large red brick archway as others cut away from the crowd, and ambled up the hill to a makeshift stage. There, a jam-packed lineup of speakers was assembling on the capitol steps. As the program swung into motion, Suarez welcomed Stein, clad in bright orange as he stepped up to the podium. “What have we done wrong that this is what we’re teaching in schools, about how to hide in a closet so that you don’t die? “We need to ban these things, and ban these things now” he said. He brought over a student with a Marjorie Stoneman Douglas school spirit banner, displaying it for the crowd. That message was echoed over and over again, as speakers from Hochsprung ’s daughter Erica Lafferty to U.S. Sens. Richard Blumenthal and Chris Murphy took the podium. Speaking candidly to the crowd, Murphy told marchers that he’d come home two weeks ago to learn that his six-year-old son had gone through an active shooter drill at kindergarten, locked in a small bathroom with 25 of his classmates and told to stay completely quiet. He added that the conversation about gun reform cannot be limited to schools, and must extend to all victims of gun violence, as it has historically failed to do. “No child in Hartford or New Haven or Bridgeport should have to wonder whether they are going to survive the walk to the grocery store to pick up milk for their parents,” he said. 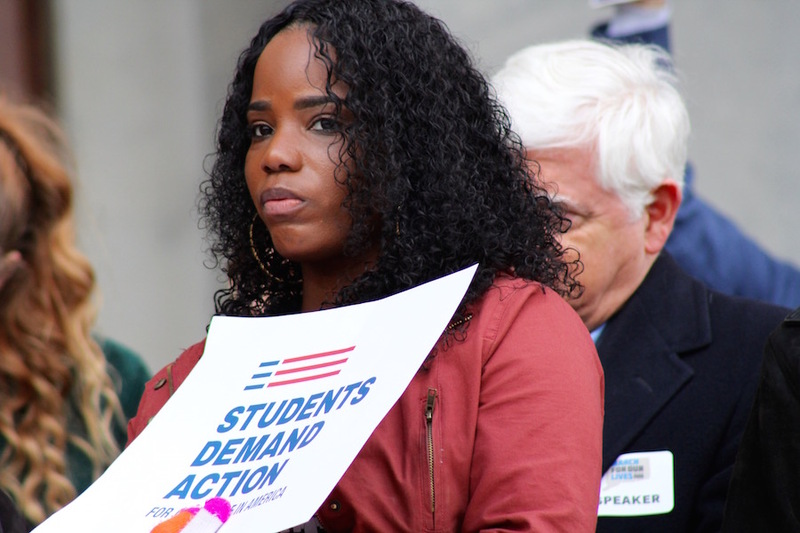 “No one in this nation should have to wonder if they are safe in school, on the streets, or in the movie theater … and we are going to change their lives." Bobbi Brown: “More than anything, I want everyone here this afternoon to understand, we’re doing something that others are not doing. We are standing together." It was just part of an overarching plea: Don’t forget communities of color, often the first to suffer from gun violence and the last to get a mention. During the last 30 minutes of the speaking program, representatives from Hartford-based Peacebuilders, Mothers Against Gun Violence, and Hartford and Bridgeport’s anti-violence groups spoke out, asking that the largely-white crowd practice some serious white accompliceship going forward. He held a white cross over his head, printed with the words “Tyrell Spence 3/9/2018.” Earlier this week, 20-year-old Spence was found in his car on Hartford’s Westland Street, shot several times. He died later that afternoon. Rev. Henry Brown: “You must look inside our inner cities, and see the pain and grief that our families are suffering every day." That was true for Bridgeport native Bobbi Brown, pumping her fist as she spoke.